The Southern Illinois University School of Dental Medicine has honored two students for their significant contributions to research and emerging leadership in the profession and community. Fourth-year student Joshua Welborn, of Harrisburg, earned The Odontographic Society of Chicago Dr. Irwin B. Robinson Student-Researcher Award for 2017. Kevin Wolf, of Springfield, a third-year student, achieved the Oral Health Foundation Pierre Fauchard Academy Scholarship for 2017. The Odontographic Society of Chicago Research and Education Foundation presents its annual award to one student-researcher from each Illinois College of School of Dentistry in recognition of their research efforts during their dental education. Under the mentorship of Anita Joy, BDS, PhD, associate professor and director of the SIU SDM Office of Research, Welborn has evaluated the role of a specific cellular signaling pathway that plays an important role during the progression of cancers, especially oral and salivary gland cancers. “Joshua Welborn has been one of the most hard-working and self-motivated students I have had the privilege to work with,” Joy said. “Pursuing research adds another level of experiential learning to the dental curriculum that is so often underestimated. It provides opportunities to think through a question or problem, troubleshoot ideas, identify mistakes, and eventually come up with answers, solutions or improved methodologies. Wolf’s $1,000 scholarship recognizes his great potential for developing into an outstanding leader in the profession because of his participation in the university, dental school or community. Wolf earned a bachelor’s in biological sciences from the SIUE College of Arts and Sciences in 2014. 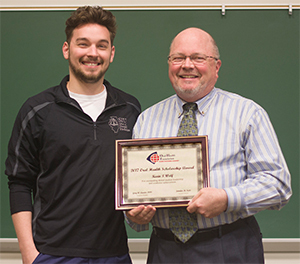 Photo: SIU SDM Dean Dr. Bruce Rotter (R) presents the Oral Health Foundation Pierre Fauchard Academy Scholarship for 2017 to third-year student Kevin Wolf (L). 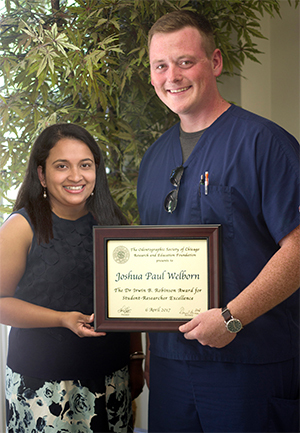 (L-R) SIU SDM’s Dr. Anita Joy stands with fourth-year dental student Joshua Welborn, who earned The Odontographic Society of Chicago Dr. Irwin B. Robinson Student-Researcher Award for 2017.